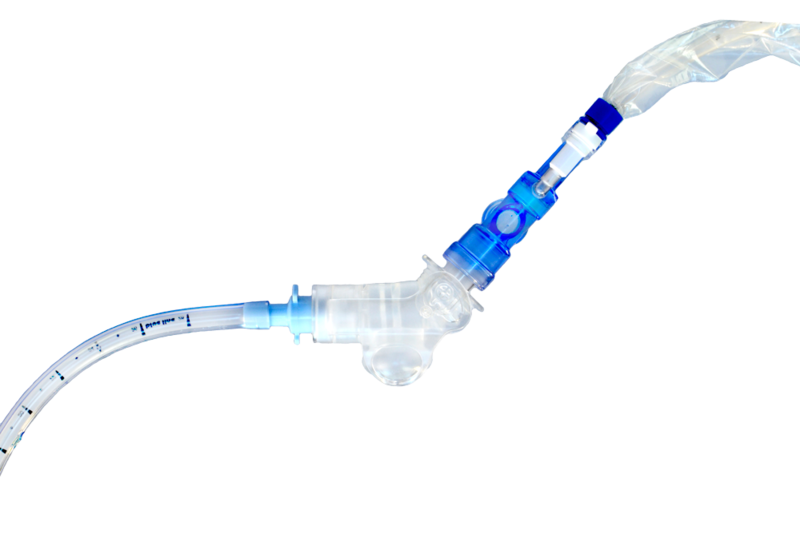 Trach-Assist is an innovative airway secretion management system designed for use between an endotracheal or tracheostomy tube and a closed suction system. Secretions are collected in a reservoir and can be removed with a closed-suction cather without breaking the respiratory circuit, which reduces the risk of VAP, hypoxemia, and lung de-recruitment. Trach-Assist® is lightweight (less than 1 ounce), features a swivel fitting for easy positioning, prevents splashing from coughs during extubation or resuscitation, and can be used with or without a closed suction system. VAP is one of the major hospital acquired infections (HAI). The reduction/prevention of these infections is extremely important to the healthcare system. Currently, secretions that are not managed can lead to premature circuit breaks due to soiled circuit components, such as HME filters, pneumotachs, and aerosol tees. Secretions that permanently travel back and forth between the artificial airway and the circuit. Secretions that become trapped in the ventilator circuit, such as in the narrow passageways of other components, which may lead to ventilator alarms.